The Catalonian Sheepdog is a flock driver that originated in the Catalonian Pyrenees Mountains. The breed is also used as a guardian. The Catalonian Sheepdog was recognized by the United Kennel Club July 1, 2006. A well balanced, medium sized herding dog with a long, rough coat. The Catalonian Sheepdog is an active, intelligent breed with a hardy and pleasant character and a noble expression. He is extremely devoted to his master and to the flocks that he maintains, but wary of strangers. The head is strong, but not heavy. The skull is longer than the muzzle in a ratio of 4:3. The skull is longer than it is wide. There is a marked frontal furrow and a prominent occiput. The upper profile of the skull is slightly domed, and the superciliary ridges are well pronounced. There is a visible, but not overly pronounced, stop. Faults: Flat skull. Lack of furrow. The muzzle is straight and rather short, tapering towards the tip, with rounded outlines. The lips are straight, not pendulous, and strongly pigmented with black, as is the palate. Disqualification: Lack of black pigment of the lips or palate. The Catalonian Sheepdog has a complete set of evenly spaced, white teeth meeting in a scissors bite. Disqualifications: Missing more than two premolars or missing more than any two teeth. Overshot or undershot bite. Disqualifications: Brown nose, or incomplete pigment of the nose. Wide open and round, dark amber in color, with black eye rims. The expression is alert and intelligent. Disqualifications: Lack of complete black pigment of the eye rims. Blue eyes. Natural ears are set high and are triangular in shape, with fine leather. They hang down and are carried close to the head. They are covered with long hair. Cropped ears are acceptable in working dogs. Solid, well muscled and rather short, but mobile. The shoulders are well muscled and slightly oblique, creating an angle with the upper arm that is approximately 110 degrees. Strong, lean, vertical and parallel, with the length of the legs from elbow to ground about the same as the distance from the top of the withers to the elbow. The elbows are close to the body, and the pasterns are rather short. Faults: Legs or feet turning in or out. The body is slightly elongated. It gives the impression of power and agility. The chest is wide and deep to the elbow. The ribs are curved, allowing for good capacity for work. The withers are well visible. The topline is straight, to a slightly raised croup that is about the same height as the withers, though at first glance it may appear higher due to the amount of coat it carries. The belly is slightly tucked up. The hindquarters are strongly muscled, powerful and vertical. The thighs are long and broad, with good bone. There is moderate angulation at the stifle and the hock. The rear pasterns are rather short, strong and vertical. There are double bony dewclaws on the rear legs that are joined to the first toe of the foot by a membrane. Faults: Lack of bone in the dewclaws, or single dewclaws. Disqualification: Complete lack of rear dewclaws. The feet are oval in shape, with hard black pads and strong black nails. The toes are webbed with interdigital membranes. Fault: A few white nails. Disqualification: Lack of interdigital membranes. All white nails. The tail is rather low set. At rest, it hangs. Tails may be long, going past the hock, or naturally bobbed, docked or tailless. The long tail forms a hook in the end, and it may be carried saber fashion, raised gaily but not curled over the back. The tail is abundantly covered with long, wavy hair. Disqualification: Tail curled on the loins. The outer coat is long and either flat or slightly wavy. There is abundant undercoat on the posterior third of the body. The head has a beard, moustache and eyebrow tufts that do not obscure the eyes. The tail and all extremities are well furnished. When the Catalonian Sheepdog sheds its coat, it loses the coat on the front half of the body first, then on the back half of the body. Fawn, from light to dark. Sable, in tones from light to dark. Grey, which is made up of white, grey and black hairs with shadings that range from silver grey to black grey. If black is dominant and mixed with white, it gives a black look that is frosted with white. Black and tan coloration is also acceptable. A few white hairs on the chest or the upper toes are tolerated, but no other white markings are allowed. No solid black spots in the coat are allowed. Disqualifications: White or black spots in the coat. Height for males is 18.5 inches to 21.5 inches. For females, it is 17.5 inches to 20.5 inches. 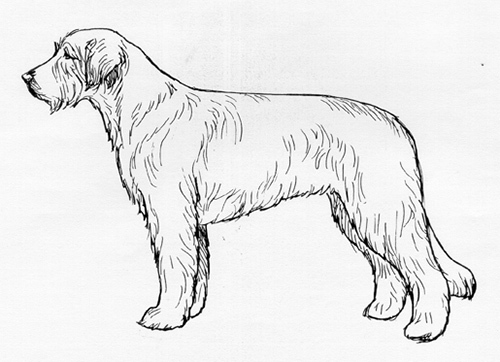 A short, supple trot, typical of breeds with rear dewclaws. More than one inch over or under the size allowed. Lack of black pigment of the lips or palate. Missing more than two premolars or missing more than any two teeth. Brown nose, or incomplete pigment of the nose. Lack of complete black pigment of the eye rims. Complete lack of rear dewclaws. Tail curled on the loins. White or black spots in the coat.